It's another at sea day today so basically a day of relaxation either on our balcony or elsewhere on the ship. It must have been a lazy one as I have very few notes to report on. At some point in the day we get a message from John and Cathy - (our Tour with Xuan tour mates) - inviting us to their cabin for celebratory drinks as John has just become a grandfather for the first time. Yesterday he had received information that his daughter had been admitted to hospital and was in labour but due to intermittent wi-fi/signal he had to last the whole day yesterday trying to find out if anything had happened. Thankfully news has been received that all is well and John and Cathy have a grandson. 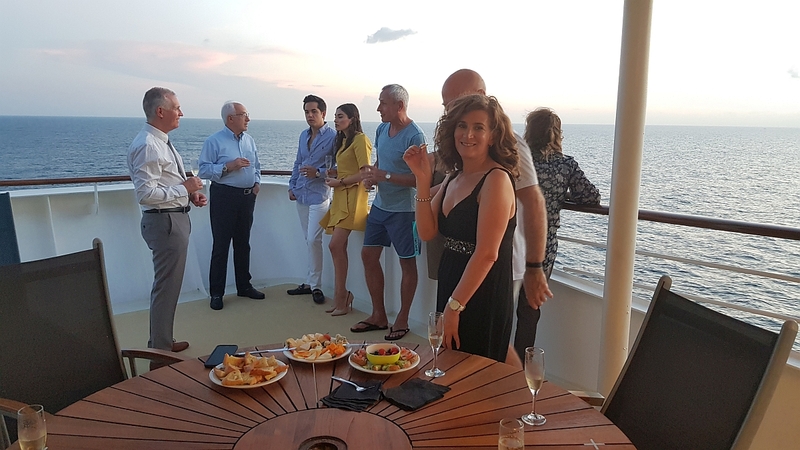 So after our day of chilling we dress up for the evening and head to John and Cathy's cabin just down the corridor for lovely drinks and canapés with other friends that they had met on this cruise. We toast the new baby's health and enjoy watching the birds swooping over the sea as the sun gets lower in the sky. We decide to continue the party at dinner, so a group of us head to the main dining room to try and get a large table. Unfortunately we're not successful in all seating together, but get a large round table next to another table. Dinner is fun and interesting talking to new people we hadn't met before today. 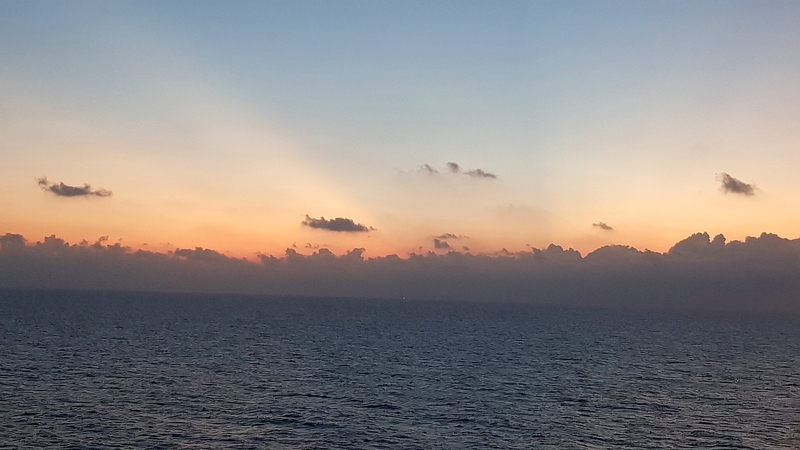 I believe we headed to either a bar or Cafe Al Baccio, but again I have nothing to substantiate that - so I'll just say we partied in the disco till the early hours of the morning, won the best dancers of the cruise competition and all got raucously drunk!